Congratulations go to our Hospitality Chef, Steven Pope-Statham, who won a National Finalist Award in the Elior National competition, held yesterday (17 January) at the Unilever Head Office. Steven was one of only 9 chefs to make it to the final, where he prepared an impressive 3 course meal in two hours and working within a strict budget. Steven joined Charterhouse nine months ago and is already making a huge impact with his innovative and creative menus for Brooke Hall. 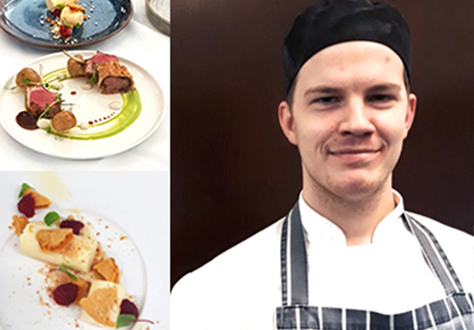 He started his career in catering as a Commis Chef in a four-star hotel, and latterly worked in Michelin-starred restaurants: Lortolan in Reading and Vinyard Stockcross, under the watchful eye of Daniel Galmiche. Steven also worked with celebrity chef Phil Thompson at the Auberge Du Lac in Hertfordshire where he honed his craft in classical French cuisine.